Clown Girl lives in Baloneytown, a seedy neighborhood where drugs, balloon animals, and even rubber chickens contribute to the local currency. Against a backdrop of petty crime, she struggles to live her dreams, calling on cultural masters Charlie Chaplin, Kafka, and da Vinci for inspiration. 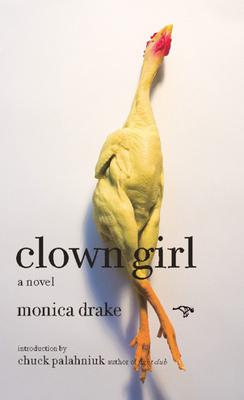 In an effort to support herself and her layabout performance-artist boyfriend, Clown Girl finds herself unwittingly transformed into a "corporate clown," trapping herself in a cycle of meaningless, high-paid gigs that veer dangerously close to prostitution. Monica Drake has created a novel that riffs on the high comedy of early film stars most notably Chaplin and W. C. Fields to raise questions of class, gender, economics, and prejudice. Resisting easy classification, this debut novel blends the bizarre, the humorous, and the gritty with stunning skill. Monica Drake has an MFA from the University of Arizona and teaches at the Pacific Northwest College of Art. She is a contributor of reviews and articles to The Oregonian, The Stranger, and the Portland Mercury and her fiction has appeared in the Beloit Fiction Review, Threepenny Review, The Insomniac Reader, and others. She has been the recipient of an Arizona Commission on the Arts Award, the Alligator Juniper Prize in Fiction, a Millay Colony Fellowship, and was a Tennessee Williams scholar at Sewanee Writers Workshop.